This is a good way to put a new twist into autograph collecting at Summer camp. One of these makes a nice momento of a summer's fun. I have never seen one of these before, but I can really picture this being on someone's bookshelf. 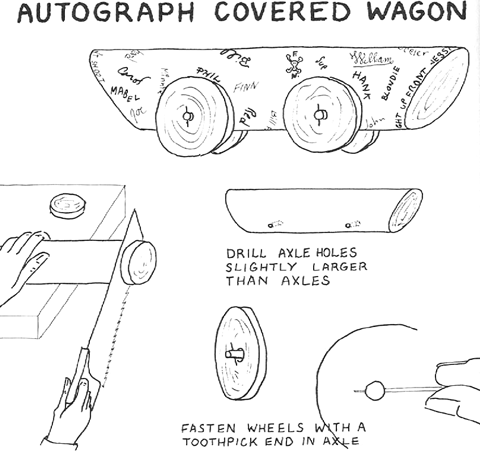 You will never forget that month at Summer camp if you have one of these autographed log wagons in your room. Find out how to make it with the following craft. This craft requires parental assitance and supervision. (Parental Assistance and Supervision Required) This is a great craft for Summer Camp...the camp counselor should help with any dangerous portions of this craft. For the body and the wheels, use a softwood log, like white cedar or pine, about 21/2 inches in diameter. Make the body slant at each end by cutting at an angle through the wood. Cut four sections 1/4 inch thick from the same log for wheels. Remove the bark and smooth all pieces with a sandblock. If the log is lumpy, smooth out the lumps with a sandblock. Twigs 1/4 inch in diameter are used for axles. Peel off the bark and sand the wood smooth. Drill holes in the wheels the same size as the axles, and holes in the body slightly larger, so the wheels will turn. Attach the wheels as illustrated, using a small sliver of toothpick to pin them in place. Smooth axle ends with a sandblock. After the wagon is assembled, collect the autographs. Use a pencil, enamel, wood-burning pencil, or any marking device as long as it isn't indelible or ball point, both of which smear and run under shellac. Shellac after all autographs are collected.